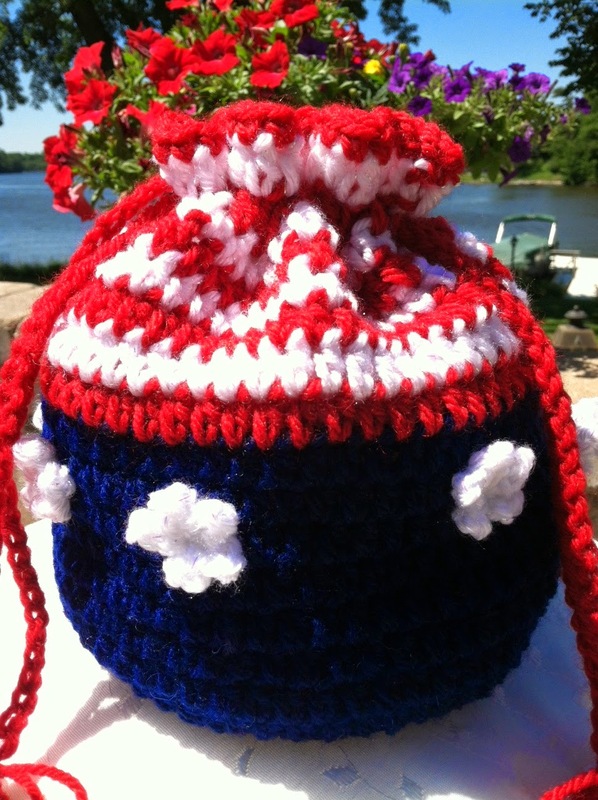 Lakeview Cottage Kids: "Stars and Stripes" Crochet Purse! FREE Pattern! Happy 4th of July!!! 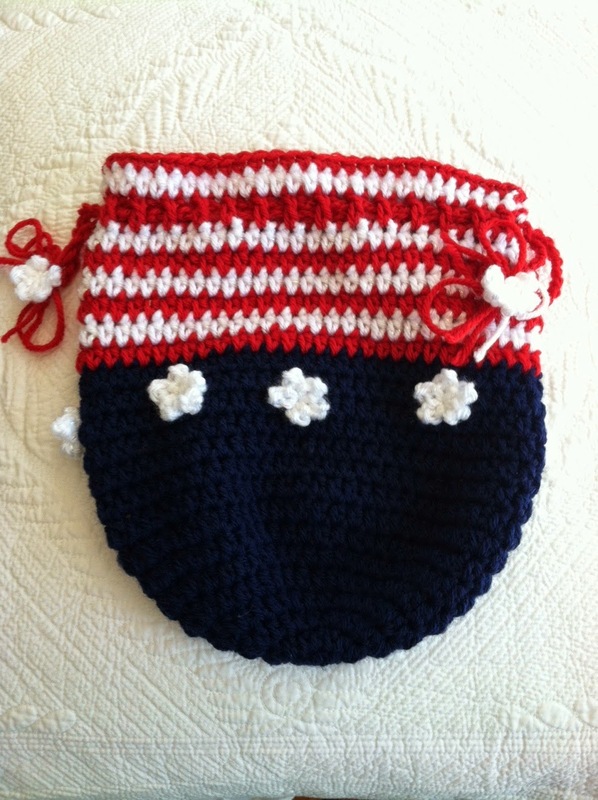 "Stars and Stripes" Crochet Purse! FREE Pattern! Happy 4th of July!!! It is an absolutely gorgeous day at Lakeview Cottage. 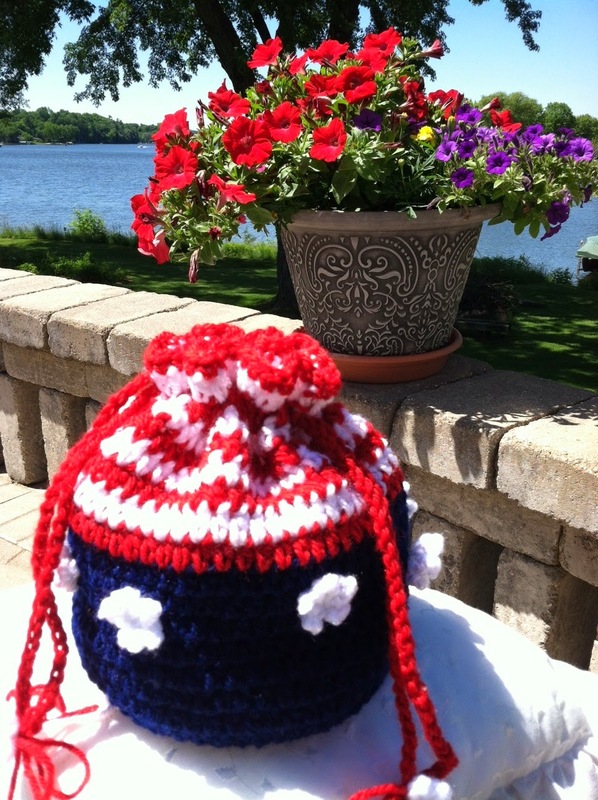 And, I am starting to get ready for our 4th of July Celebration! A little early, yes, but I am having a great time preparing! 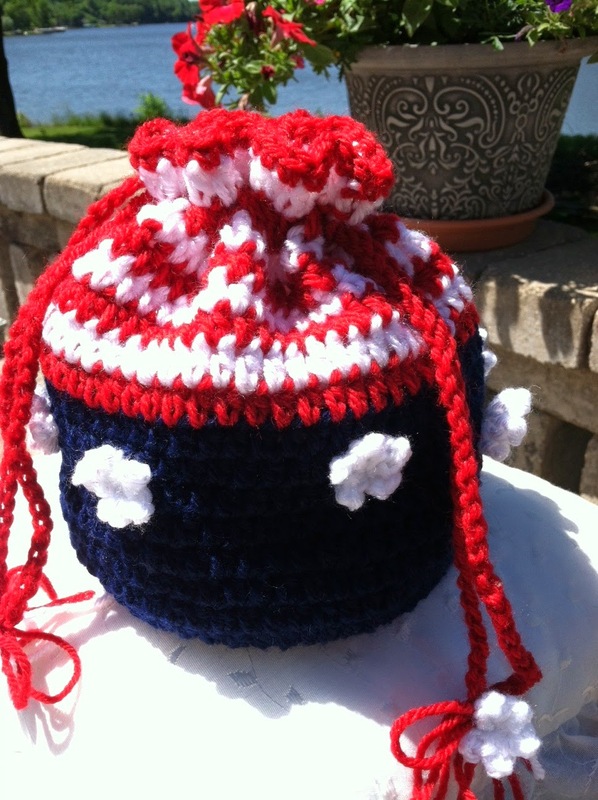 And, in keeping with that, I have created a really cute, and very patriotic, purse for the summer and holiday! It is perfect to carry to the parade and/or the cook-out! It's actually great for any summer activity! It is perfect for both an adult or a child. I had a really fun time creating it and I hope you will enjoy making and using it, too! It works up very quickly and easily!!! Enjoy! And, Happy Birthday, USA!!!! The photographs and patterns included in this document are the property of Lakeview Cottage Kids. Any reproduction, copying or sharing of this pattern is not allowed. This pattern is for personal use only. Items made using this pattern may be sold, but please give credit to Lakeview Cottage Kids. Size: Approximately 12 inches tall and 10 inches wide when flat. Round 2: Ch 1. Work 2 hdc in each stitch around. Join to first hdc with slip stitch. Round 3: Ch 1. *Work 1 hdc in first stitch. Work 2 hdc in next stitch. * Repeat from * to * around. Join to first hdc with slip stitch. Round 4: Ch 1. *Work 1 hdc in next 2 stitches. Work 2 hdc in next stitch. * Repeat from * to * around. Join to first hdc with slip stitch. Round 5: Ch 1. *Work 1 hdc in next 3 stitches. Work 2hdc in next stitch. * Repeat from * to * around Join to first hdc with slip stitch. Round 6: Ch 1. *Work 1 hdc in next 4 stitches. Work 2hdc in next stitch. * Repeat from * to * around Join to first hdc with slip stitch. Round 7: Ch 1. Work 1 hdc in each stitch around. Join to first hdc with slip stitch. Round 8: Ch 1. *Work 1 hdc in next 5 stitches. Work 2hdc in next stitch. * Repeat from * to * around Join to first hdc with slip stitch. Round 9 - 15: Ch 1. Work 1 hdc in each stitch around. Join to first hdc with slip stitch. Round 16: (Change to Color B) Ch 1. Work 1 hdc in each stitch around. Join to first hdc with slip stitch. Round 17: (Change to Color C) Ch 1. Work 1 hdc in each stitch around. Join to first hdc with slip stitch. Round 18: (Change to Color B) Ch 1. Work 1 hdc in each stitch around. Join to first hdc with slip stitch. Round 19: (Change to Color C) Ch 1. Work 1 hdc in each stitch around. Join to first hdc with slip stitch. Round 20: (Change to Color B) Ch 1. Work 1 hdc in each stitch around. Join to first hdc with slip stitch. Round 21: (Change to Color C) Ch 1. Work 1 hdc in each stitch around. Join to first hdc with slip stitch. Round 23: (Change to Color C) Ch 1. Work 1 hdc in each stitch around. Join to first hdc with slip stitch. Round 24: (Change to Color B) Ch 1. Work 1 single crochet in each stitch around. Join to first sc with slip stitch. Drawstrings: (Make 2) Shown in photo. (Using Color B) Ch 75. End off. (Using Color B) Ch 75. Turn and in second stitch from the hook, slip stitch and continue working a slip stitch in each ch to the end. Turn. Slip stitch in each ch all the way to the end. Fasten off. This makes a more sturdy drawstring. With purse flat, start at right side and weave one drawstring through Row 22 of purse…..going over dc, under dc , over dc, under dc all the way around. With purse flat, starting at left side, weave second drawstring through same Row 22 and with same over, under, over, under weaving technique all the way around. Tie ends of each drawstring together and attach 1 star to end of each. These stars were made using the free pattern available at Repeat Crafter Me. Sew 8 stars to purse. Refer to photo for placement. Attach a star on the end of each drawstring. Enjoy! And, Happy 4th of July!!!! After a Busy Day.....A Ride on the Pontoon! FREE Pattern for "Oh So Colorful Summer Coasters"